. إن الخدمات التي يقدمها The Tree House تضمن للنزلاء إقامة مريحة. إن تسجيل وصول/خروج سريع, تخزين الأمتعة, صف السيارات, غرفة عائلية, جولات هي جزء فقط من الخدمات التي تميز The Tree House عن باقي الفنادق في المدينة. استمتع بوسائل الراحة الراقية في الغرف أثناء إقامتك هنا. بعض الغرف تتضمن غرف لغير المدخنين, مكيف هواء, مكتب, شرفة/ تراس, مروحة لمساعدتك على استعادة طاقتك بعد يوم طويل. كما أن مجموعة الخدمات الواسعة الموجودة في الفندق لضمان راحتك تترك لك الكثير من الخيارات لقضاء وقتك أثناء فترة إقامتك. إن The Tree House هو خيار ذكي بالنسبة للمسافرين إلى جزيرة برانى، بما يوفره من إقامة هادئة ومرحة. Would highly recommend a stay at the Treehouse. Easy check in was easy, was very thoughtfully equiped throughout from appliances through to cooking supplies in the kitchen. A panoramic view from the bedroom, lounge and kitchen with two great versndahs to make the most of it. The stairs to the upstsirs bedroom are steep but the view and ambience of this room was worth it. Have already recommended the Treehouse to friends and look forward to going back. We thoroughly enjoyed our weekend at the Tree House on Bruny Island. The views from the deck and the comfortable lounge are spectacular. The property is spotlessly clean and has a full size, well equipped kitchen. We’re already planning a winter visit to enjoy the wood fire. The Tree House was immaculate, and we'd be happy to stay here again! The only thing that was a little tricky was the steep unpaved driveway in our tiny car, but the house was a fantastic place for a quiet escape, and the kitchen was fully stocked with condiments for self-caterers -- much better than other rental accommodation where you get only salt and pepper! Highly recommend. Amazing view, cool living experience, excellent ocean. The Tree House is a unique property with sea views, it was clean and comfortable, I loved the open fire place. 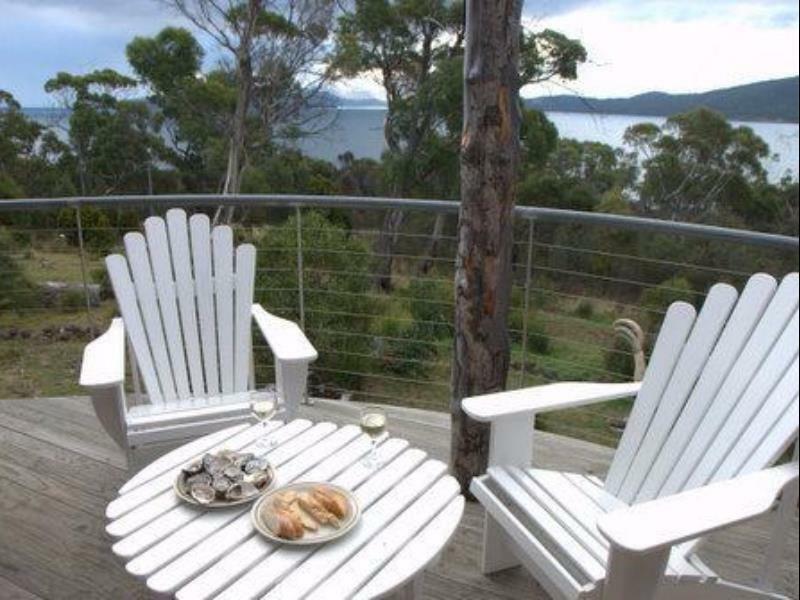 It's a nice place to relax and base yourself whilst in Bruny island. It contains all needed amenities. Unfortunately we didn't get to stay as long as we had planned. The drive-way is a bit steep and rocky but worth the trip. The bedroom layout is one queen bed in open plan style in living area and one queen bed upstairs on a mezzanine type floor, with very steep stairs (not for the faint hearted)and difficult to get luggage up. Otherwise a lovely property. The drive way should be improved. It's only suitable for 4WD. The cottage is set back from the road with lovely views in all directions. Inside, the cottage is tastefully fitted out in an open plan style with lounge, kitchen and bedroom on the ground floor. There is a choice of three verandah areas on the outside . Inside there is quirky staircase to the first floor bedroom. The location is superb and we saw eagles soaring over the shoreline and wallaby, echidna and possums were seen in the gardens. There is an attractive walk from near the cottage which follows the shoreline back to Alonnah where there is pub offering good value food and very friendly service. The cottage has the 'wow' factor and our two night stay was too short. Great design and layout. The house had everything we needed. This house was a highlight in our 10 day trip to Tasmania. Watching the sunset on the deck overlooking the water was superb. The owners had some excellent suggestions as to what to do, where to shop while on the Island. Highly recommend this property.